We had to a birthday party to attend in the morning and nothing else planned for the afternoon, but with the not so good weather outside (sprinkling all the time) I had to think of something to keep my little man busy - and quiet, so he didn't wake his sister up. 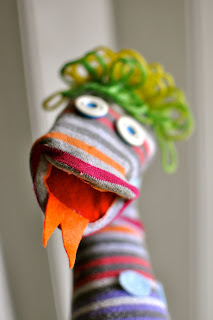 I have thought about making sock puppets for a long time, but today seemed to be the perfect day for it. I grabbed an old pair of socks, my hot glue gun, some felt, yarn and buttons. When I asked the little man if he would like me to make him a sock puppet he sounded excited, so I asked him what kind of puppet, thinking he would say he wanted a dog or a bunny, something along those lines, but he said he wanted a monster. I apologize for the picture, but it was extremely hard for me to wear it and take pictures at the same time. As soon as he saw the puppet he named it Teddy and it made me giggle that he can be creative now, come up with names for his toys on his own.